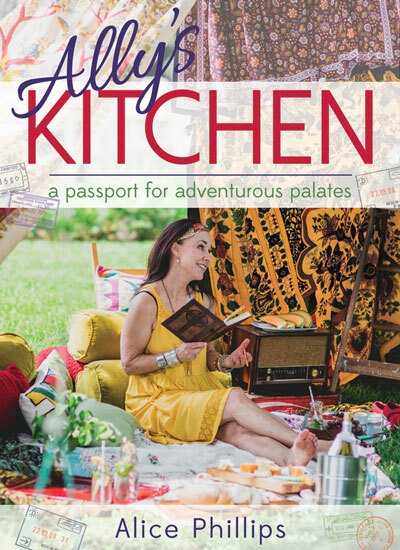 If you don;t feel like an around the world ticket is in the budget this year go down to your local bookstore or order up Ally’s Kitchen: A Passport for Adventurous Palates–no visas needed. This $28.99 (retail) book will fill your home with the delightful tastes of world cuisine. Phillips allows for the fact we may not ave access to international markets where we live so she offers up a chapter on how to put together some typical spice blends. Intimidated by international cooking? Don’t be. Phillips opens the book with the mantra that each cook knows best–something she lives by– and the changes you make in her recipes to accommodate your family will make the recipe better. In fact, she herself is a home cook who has achieved international fame. She has won multiple cooking contests and her food blogging prowess has landed her a job as Dole Foods Media person. “A lot of love, Boho and otherwise went inthte making of this book–taht is evident. Ally infuses the book with her particular brand of enthusiams and knowledge–a combination that results in creations that are as delicious as they are wonderful to admire on the plate. You’re not alone when you open this cookbook. Ally’s voice and positive persona are with you on each and every page. She is a marvel and her recipes are too! Sampling Oysters by Joan Leotta. If you are searching for a great beach read—friendship, family, a touch of ecology and romance—well, then, this is the book for you. If you have read books one and two in the Low Country Summer Trilogy, you are already invested in the three young women spending the summer with their Mawmaw in her wonderful house, Sea Breeze, on Sullivan’s Island just outside of Charleston. The three granddaughters each arrived at the house beginning of the summer(in the first book of the series)with more than standard issue suitcases. The baggage from their lives lived away from the paradise of summer with Mawmaw. The girls (now women) are half sisters, children of Mawmaw’s son and three different women. The differences and similarities that could have made them steallar friends, have instead, over the years, drawn them apart,. Mawmaw and her house are their only common touchstone. If you haven’t read the series to this point, you can just jump in and the “water” will be as fine as warm ocean tides around the Island. Dip your toes into the story’s waves as they glide up to the beach in the first few pages of the book to catch you up on Mawmaw’s plan to let “her girls” find themselves and renew the kind of strong friendship sisters should have. Let her slowly immerse you in the magic of the relationship all of them have with a dolphin, and the budding romances that will, we hope be the right ones for the girls, enabling them to sparkle in freedom and still enjoy the closeness of true love. Mawmaw’s plan to sell the old house and move into senior living is part of the new intrigue of this particular novel. Mentioned before, but comes to the front of this volume).Without giving away any of the delightful particulars of this book, let me say that Monroe manages to tie up the parts of the book that should be tied and leave us just enough room to imagine her characters pushing off into a happy life after the book’s sunset. One bit of warning—keep tissues by your side as you read this book. This one should be the first one into your beach bag. Your only regret will be that there on more to come in this series. If you want to meet Mary Alice Monroe, check out Litchfield books. Phone 237 8138 to reserve a place and find out the cost of the luncheon. There is no cost to attend the book signing, tho it is customary to purchase a copy of the featured book for the author to sign. Near the end of my time as a Tupelo Press 30/30 poet, frantically crafting poems to be posted each day, one of the poets issued a challenge. She asked us to try writing in the style of one of the others. The young man she assigned to me is a stylish, wonderful poet–award-winning and creator of sharp staccato lines and images. Oh dear. So, I studies the poems he posted and researched more about him and his work. Then I put forth my pen (okay, keyboard) and attempted something in his style. The exercise was more than simple fun. It was a tremendous learning exercise. That young poetry master taught this old poetry novice more than a few tricks–without even sending me an email. In order to copy him,I had to analyze his use of words, line , rhyme (if any), lyric, etc. What effect did he achieve with each poem? How did his use of poetic elements lead him to that? I chose a topic, I attempted to work within his mindset and then I wrote. And posted. Study the old to transform your work into something new–a mantra that is helping my work improve. Just the simple exercise of writing more each day brought my work a step higher and I have had several poetry acceptances since the Feb 3030–essays too. Since Feb I finished book four of my Desert Breeze Series and am working on the Book Club Questions and press releases for these. Also, my collection of short stories is almost out–publishing issues–but now Cane Hollow Press personnel are well and ready to roll and that too, will soon be out–working on a class outline for teaching Ekphrastic Storytelling for that one. More to come! I hope to have another post with useful information in it by mid-June. Meantime, expect a couple of book reviews and maybe some news on Turkey.